Heat oven to 375°F. Line large cookie sheet with cooking parchment paper. Place crescent rounds on cookie sheet; press each crescent into 2 1/2-inch round. Brush with egg; sprinkle with poppy seed. Bake 8 to 13 minutes or until golden brown. Remove from cookie sheet to cooling rack. Meanwhile, in 10-inch skillet, heat oil over medium heat. Add onions, salt and pepper; cook 3 to 5 minutes, stirring frequently, or until onions are tender. Add chicken broth and balsamic vinegar; cook 12 to 17 minutes or until sauce is reduced by half. Stir in red raspberry and apricot preserves; cook 2 to 3 minutes, stirring frequently, or until slightly thickened. Cool 5 minutes. Cut each crescent round in half horizontally. 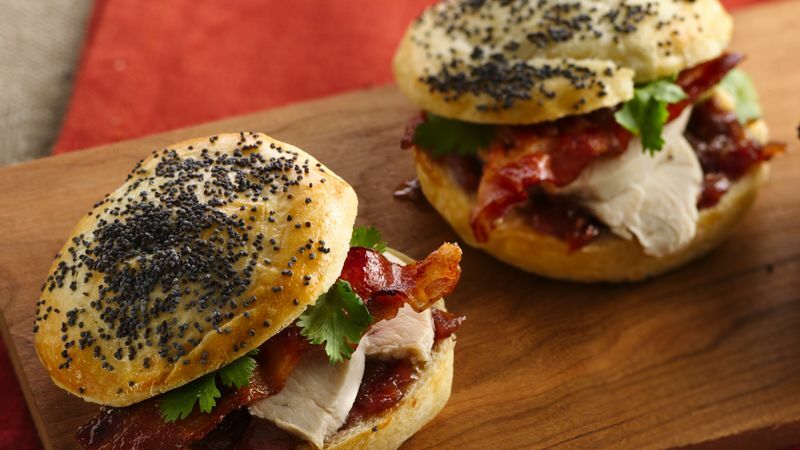 Place bottoms of buns on serving platter; top each with 2 teaspoons of the onion mixture, chicken, bacon, cilantro and top of bun. LAND O LAKES is a registered trademark of Land O’Lakes, Inc.